The loneliness of everyday life, lacking a certain connection or feeling out of place is a phenomenon most, if not all of us, have at one time felt. Physical solitude, whether it be voluntary or involuntary, is much the same – we’ve all been literally isolated from other people. There is a third kind of solitude reserved for the exception, the individual who is alone by dint of being the first into uncharted territory. Part of the American culture of individual empowerment is a reverence for this type of individual, which is why so many of our folk heroes are explorers or voyagers, from Daniel Boone to John Glenn. 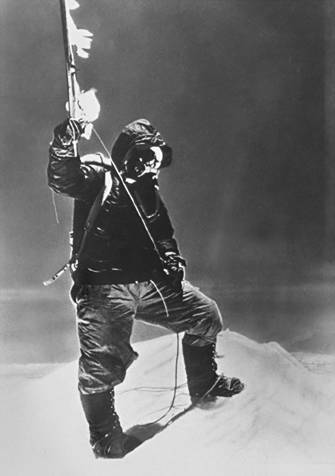 Sir Edmund Hilary, first man to summit Everest and a pioneer in every sense. Pioneer 10 – The probe that brought us Jupiter. In 1972, Pioneer 10 was launched with the intent of doing some bang-up photography of Jupiter, which produced some pretty cool and scientifically intriguing images. More fascinating to me, though, is the aftermath of the intended Pioneer mission, which officially ended in 1997 – 14 years after leaving Neptune’s orbit. The probe continued to transmit data to Earth for another six years until, finally, in 2003, its signal weakened to the point of non-detection. Since then, Pioneer 10 has traveled for ten more years into deep space, completely and utterly alone but carrying with it the distinction of being the first spacecraft to achieve escape velocity from our solar system. If you’re interested in the Pioneer Anomaly or in other NASA spacecraft performing above and beyond the call of duty, click away. The Swim – Diana Nyad, at age 64, swam from Cuba to the United States without a shark cage. This happened yesterday, and in case you missed it, she swam from Cuba to the United States. That’s 160km, 53 hours of nonstop swimming. Incidentally (and of the highest relevance) she was the first to successfully accomplish this feat.